Those Vee tubes are that thick you'd be forgiven for thinking you could run it without the tyre. I still manage to put holes in them. A talent I'm sure you wish you didn't have! a bit slip slidey but hey. Got my MT into the newspaper after last night's bike night in town. 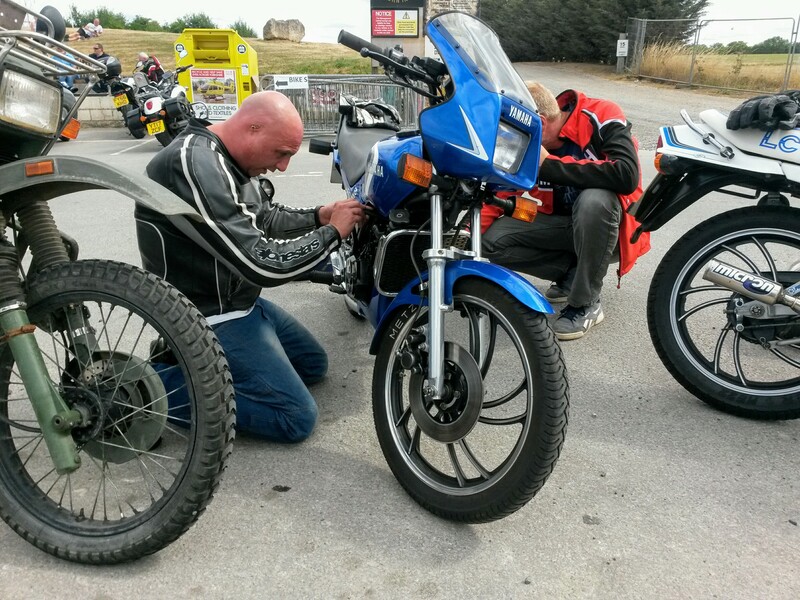 Went for another ride with my loony RD125LC riding mates, this time we made it to Squires without incident (in spite of their shite navigation), coming home however, required another AA callout to get my mate home. First off it wouldn't start when we came to leave the cafe, then after bumping it off it just ran progressively worse until it died south of Selby. I got out my tool kit, the carb was full of crud and the pilot jet blocked hence not starting well. Cleaned up but still wouldn't go, removed the plug, no spark, naff all! So he rang the AA and we left him and rode home. Needless to say my MT did 130 miles without missing a beat! Headlight dual relay mod.,front boxes/mounts and iron work removed. Ordered 40mm Ammo boxes for the back end. Still got to put that 42 jet in but i am fed up taking the carb off so it can wait..
Fitted some nice new pannier bags from wildextreme.co.uk, converted the indicators to LED (way way better) and fitted an indicator buzzer from Azonic Solutions - so now I don't got go around with the indicators on any more! 40mm Ammo box panniers fitted.